What codes are you referring to? What are the “Other Code Combinations” used for? They are used for the search feature. 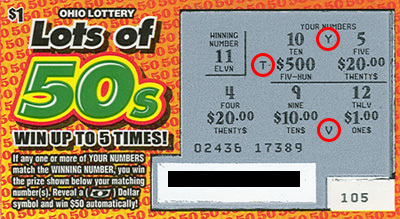 If someone has a winning ticket for $1.00 and they type “OEN” into the search box, there would be no results for that code. What does the speech bubble icon on the right side mean? That speech bubble icon indicates that a user submitted that code. If you click on it, the page will slide down so you can read their comment. Why aren’t there any codes listed on my state’s page? When I emailed all of the state lotteries, not all of them were willing to give me the codes. So, if you know any of the codes, you can leave a comment on that specific page. If I do a search for a code and there aren’t any results, is the ticket a loser? Not necessarily… I don’t have 100% of all the codes and even if I did, some states don’t have codes for big winners. I would recommend taking your ticket into a lottery retailer and have them scan the ticket. Why was my comment removed from the site? From time to time, I remove comments in order to keep the page clean and free of comments that don’t provide any helpful information for visitors. A common comment that gets removed is asking what a certain code means. If nobody responds within a few days, it will get removed. I just won a million dollars! Is there any way that I can send you some money? Yes, send me an email and I’ll give you my PayPal address.